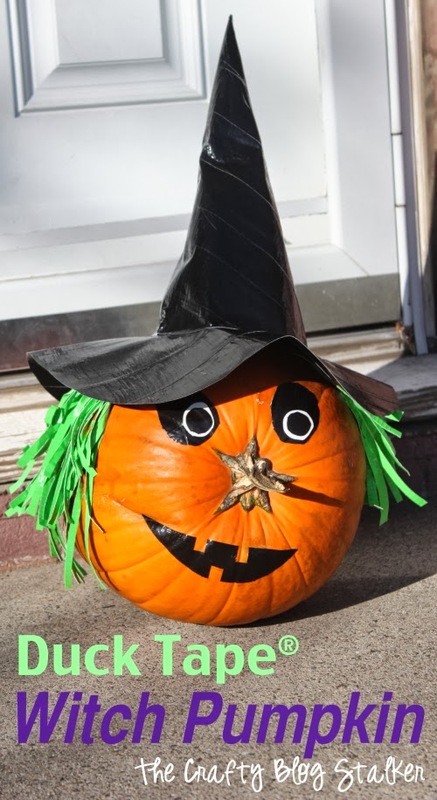 Dress up your Jack O’Lantern for Halloween as a witch pumpkin. 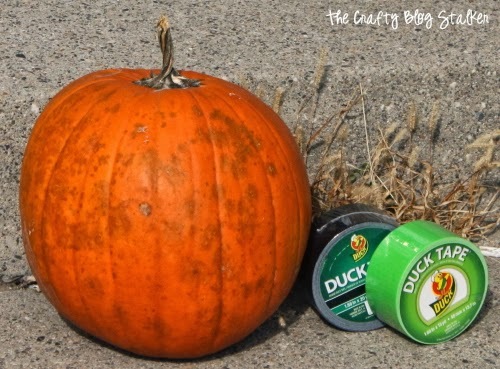 A no-carve idea using Duck Tape to decorate a pumpkin. An Easy DIY Craft Tutorial Idea. This is a sponsored post on behalf of Duck Brand. All opinions are my own because I love giving you helpful tutorials! Halloween is one of my very favorite holidays and I love to get crafty this time of year. There are so many different ways to decorate for Halloween and I love them all. 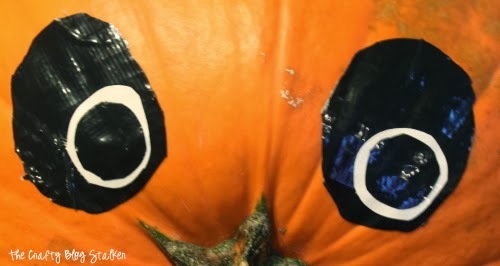 Today I am going to show you a great way to decorate a pumpkin without carving! I picked my pumpkin because I liked all of its freckles! 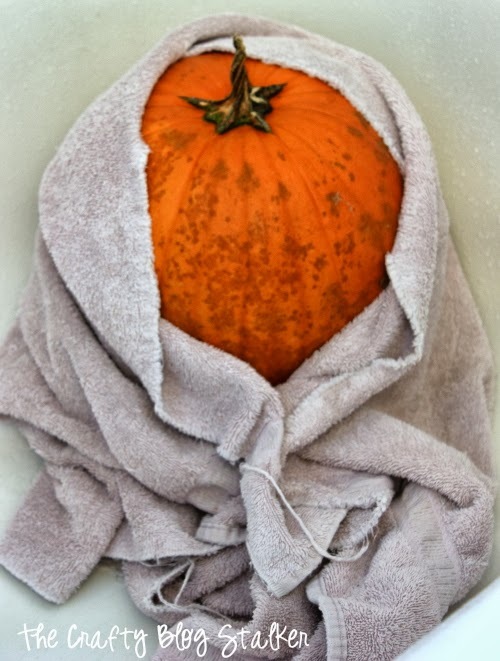 When my baby pumpkin was all clean I started with the eyes. Very simple. Cut a piece of black Duck Tape®, cut an oval shape and a smaller circle, and cut a circle out of the white Duck Tape® to make the eyes. The mouth was a little tricky because the tape kept wanting to stick to itself, so I cut a strip and lightly applied it to some transfer paper, like what you would use for vinyl. I cut it out, removed the transfer paper backing and put the mouth in place. Now that my pumpkin has a face it is time to start working on the green witch hair. I cut one strip of the green Duck Tape® and cut another piece that is just a little bit shorter. I put the two sticky sides together. Making sure to leave one side with the sticky still exposed. 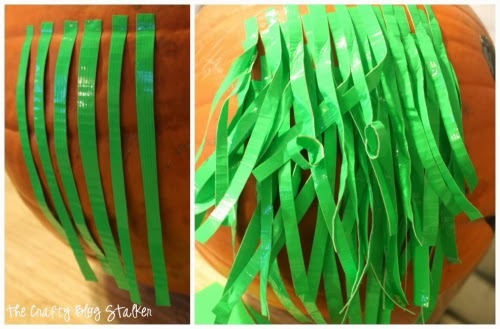 Cut the strip into smaller strips and use the exposed sticky end to stick the “hair” to the pumpkin. I did about five rows on each side and scrunched up each strand to give a crazy hair look. The witch hat is also made out of Duck Tape®. I made 2 sheets using the same technique as for the hair but kept adding strips until it made sheets with no sticky exposed. I rounded an end of one of the sheets and rolled it into a cone. 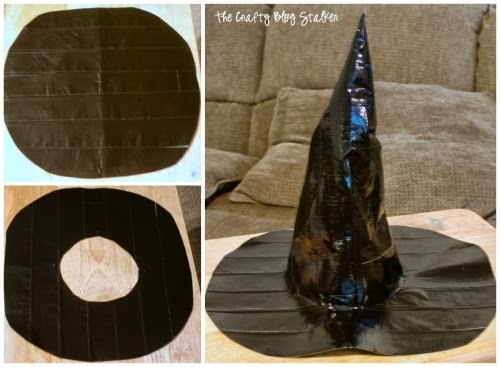 For the brim of the witch hat, I took the second sheet and cut it into a large circle. I taped the cone to the circle by using small strips of Duck Tape® and taping the cone to the rim from the inside of the cone. When the whole ensemble is put together, my witch pumpkin is so cute!! I think she turned out even cuter then I thought that she would. 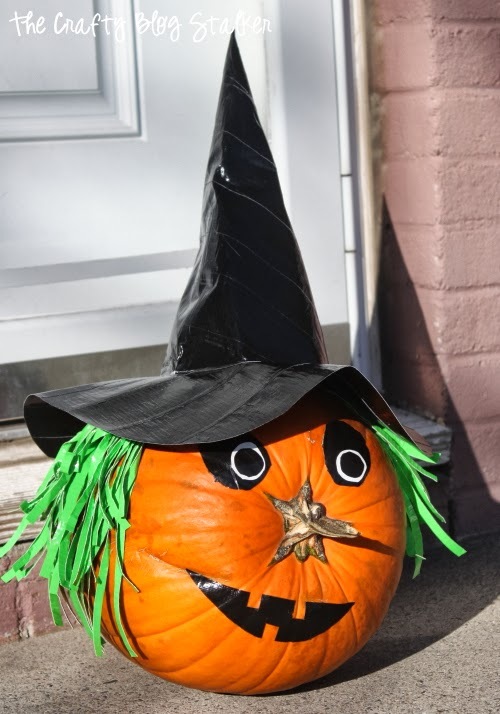 What scary, silly, or fun pumpkin are you going to decorate? 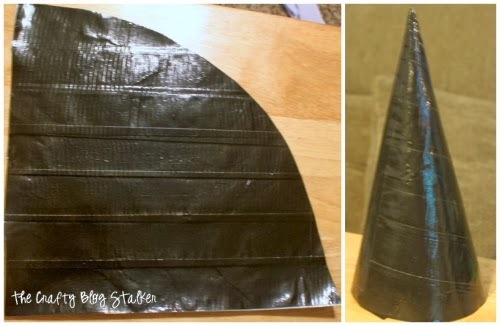 SAVE HOW TO MAKE A DUCK TAPE WITCH PUMPKIN TO YOUR FAVORITE PINTEREST BOARD! Wow that’s really cute! I love the hat! That is too cute! I love how you turned it on the side, and that hat is perfect. So cute and a little easier for little ones. LOL This is super fun! I love Duck Tape! and I love this project! Cute. Pinning! Thanks for linking to Take-A-Look Tuesday over at Sugar Bee Crafts – I featured you today! Thank you for sharing on Marigolds’ Loft Tutorial Thursdays Linky Party. I look forward to seeing you again at next month’s party. Thanks Amanda, as long as they give proper credit I am totally fine with it. Thank you!